Kerosene oil poisoning leading to aspiration is a very uncommon mode of hydrocarbon poisoning in adults. Many hydrocarbons in kerosene like hexane, naphthalene, octane, and phenanthrene are toxic to humans. The most serious side effect is aspiration pneumonia. Hydrocarbon aspiration (HA) can cause significant pulmonary disease by inducing an inflammatory response, hemorrhagic exudative alveolitis, and loss of surfactant function. Secondary effects in the lungs include pneumothorax, pneumatocele, or bronchopleural fistula. We searched for a case of bilateral hemorrhagic pleural effusion occurring in adult following kerosene ingestion but to the best of our knowledge, such a case has not been reported till now. Hence, we are reporting this case. The hemogram (hemoglobin level, RBC count, platelet count) except for TLC, coagulogram (APTT, INR, fibrin degradation product level), and routine blood biochemistry (serum urea, creatine, random blood sugar) were within normal limits. His total leucocyte count (TLC) at admission was 14 400/cu.mm. An arterial blood gas analysis revealed arterial oxygen tension (pO 2 ) 78 mmHg, pCO 2 40 mmHg, HCO 3 25 mEq/l, and pH 7.38. 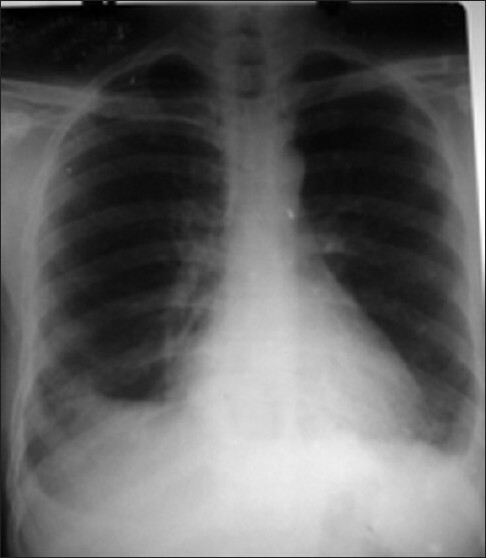 Chest X-ray showed bilateral homogenous opacities with bilateral pleural effusion [Figure 1].The ultrasound thorax revealed 250 ml pleural fluid in the right pleural cavity and 150 ml in the left pleural cavity. A contrast enhanced CT thorax at admission showed bilateral pleural effusion with consolidation in the basal segment of both the lower lobes and nodular pleural thickening in the right lower lobe [Figure 2]. 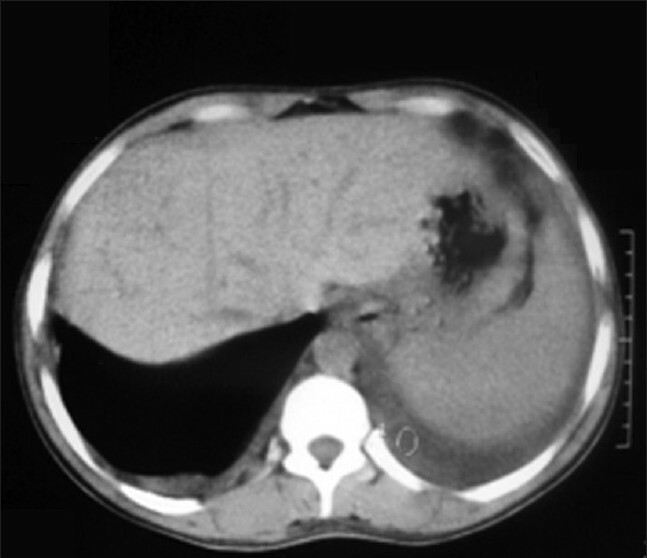 Diagnostic USG guided thoracocentesis of both the sides revealed hemorrhagic effusion on gross appearance. Biochemical analysis revealed them to as exudative in nature with ADA values of 9 IU/ml and 12 IU/ml of left and right side, respectively. Microscopic examination of pleural fluid revealed plenty of RBCs and 100% differential polymorph count in the left sided effusion and 80% differential polymorph count in the right-sided effusion. They were also negative for AFB or any microorganism on smears. Fibreoptic bronchoscopy revealed generalised hyperaemia of the tracheobronchial tree with pus oozing out from the more distal airways bilaterally. ZN staining of BAL fluid was negative for AFB. However, stained smear examination of BAL showed plenty of RBCs and neutrophils. Pleural fluid and BAL samples were sterile on culture. The patient was treated with oxygen supplementation, oral corticosteroids (prednisolone at 1 mg/kg body weight) and injection ceftriaxone given 1 g thrice a day by intravenous route. The patient responded to the treatment and became afebrile with improvement in breathlessness and pleuritic chest pain. His TLC came down to 8000/cu.mm after 7 days of treatment. 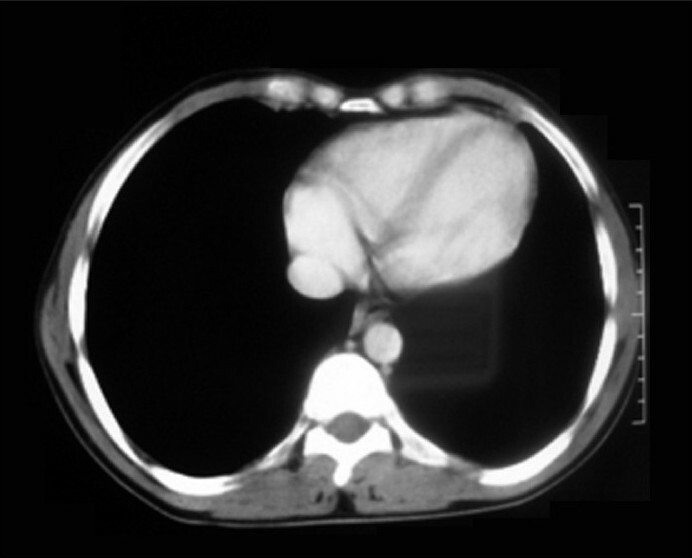 A repeat CT thorax done after 15 days showed resolution in the areas of consolidation and effusion [Figure 3]. Antibiotics and steroids after tapering were stopped after 3 weeks. The patient was discharged in a stable condition. Hydrocarbons are heterogeneous group of substances that are primarily composed of carbon and hydrogen molecules. They are quite abundant in modern society. Some of the most commonly used hydrocarbons include gasoline, lubricating oil, motor oil, mineral spirits, lighter fluid/naphtha, lamp oil, and kerosene. Hydrocarbons can be classified as being aliphatic (ethane and acetylene), aromatic (toluene and phenol), or halogenated hydrocarbons which are a subgroup of aromatic hydrocarbons (chloroform and carbon tetra chloride). Hydrocarbon exposure can be divided into the following four broad categories: nonintentional nonoccupational (or accidental, as occurred in our case), recreational, occupational, and intentional exposure. Kerosene poisoning is rare among adults. It is a common practice in India for traders to buy kerosene in drums in bulk and then sell them in small amounts to individuals who bring their own jerry cans. To take out the kerosene from the drum, a vacuum is created in the hose by siphoning out the air using one's mouth. Our patient mistook the amount of negative pressure required and ended up swallowing about 50 ml of kerosene after which he had an episode of vomiting and aspiration of the vomitus. Over the next 3 days he had nausea but no vomiting. Nausea subsided after that. To the best of our knowledge, our patient who developed bilateral hemorrhagic pleural effusion following aspiration of Kerosene while trying to siphon it out is the first reported case in Indian literature. The patient recovered satisfactorily following initial treatment consisting of oxygen inhalation, antibiotics, steroids, and supportive measures without any residual pulmonary sequel. 1. Bronstein AC, Spyker DA, Cantilena LR Jr, Green J, Rumack BH, Heard SE. Annual Report of the American Association of Poison Control Centers' National Poison Data System (NPDS). Clin Toxicol 2007;45:815-917. 2. Ofusori DA, Ayoka AO, Adeeyo OA, Adewole SO. Mixture of kerosene and xylene: A contribution to clearing agents. Int J Morphol 2009;27:211-8. 3. Patel AL, Shaikh WA, Patel HL, Deshmukh D, Malaviya AP, Janawar P, et al. Kerosene poisoning--varied systemic manifestations. J Assoc Physicians India 2004;52:65-6. 4. Lall SB, Al-Wahaibi SS, Al-Riyami MM, Al-Kharusi K. Profile of acute poisoning cases presenting to health centres and hospitals in Oman. East Mediterr Health J 2003;9:944-54. 5. Wax PM, Beuhler MB. Hydrocarbons and Volatile Substances. In: Tintinalli JE, Kellen GD, Stapczynski S, Ma OJ, Cline DM, editors. Emergency Medicine: A Comprehensive Study Guide. 6 th ed. New York: McGraw-Hill Medical Publishing Division; 2004. p. 1124-30. 6. Lifshitz M, Sofer S, Gorodischer R. Hydrocarbon poisoning in children: A 5-year retrospective study. Wilderness Environ Med 2003;14:78-82. 7. Dyer KS. Hydrocarbons. In: Wolfson AB, Hendey GW, Ling LJ, Rosen CL, Schaider J, Sharieff GQ, editors. Harwood- Nuss' Clinical Practice of Emergency Medicine. 4 th ed. Philadelphia: Lippincott Williams and Wilkins; 2005. p. 1590-3. 8. Domej W, Mitterhammer H, Stauber R, Kaufmann P, Smolle KH. Successful outcome after intravenous gasoline injection. J Med Toxicol 2007;3:173-7. 9. Bebarta V, DeWitt C. Miscellaneous hydrocarbon solvents. Clin Occup Environ Med 2004;4:455-79. 10. Shotar AM. Kerosene poisoning in childhood: A 6 year prospective study at Princess Rahmat Teaching Hospital. Neuro Endocrinol Lett 2005;26:835-8. Schneider, S. and SchÃ¼rch, D. and Geiser, M.
Azeez, O.M. and Akhigbe, R.E. and Anigbogu, C.N.